The Ralston-Kibo family didn’t let the difficult visit keep them down. Soon, they were back to their regularly scheduled program. 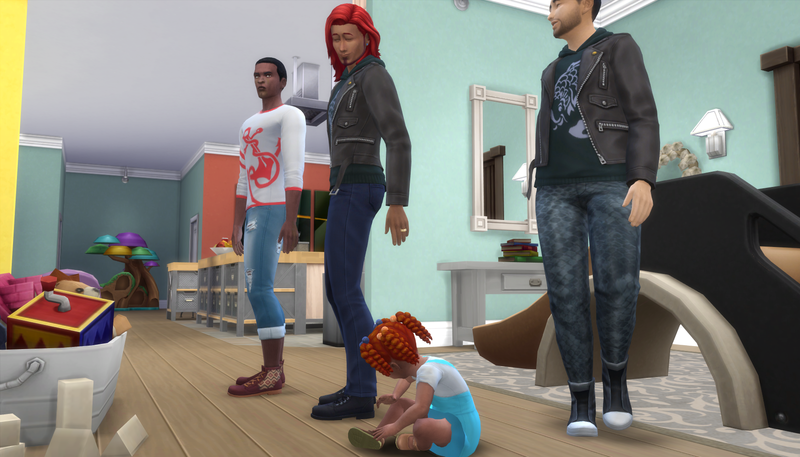 They were working hard to get all three toddlers potty trained. Believe it or not, potty training was one of the easy parts. Meal time could be more complicated. 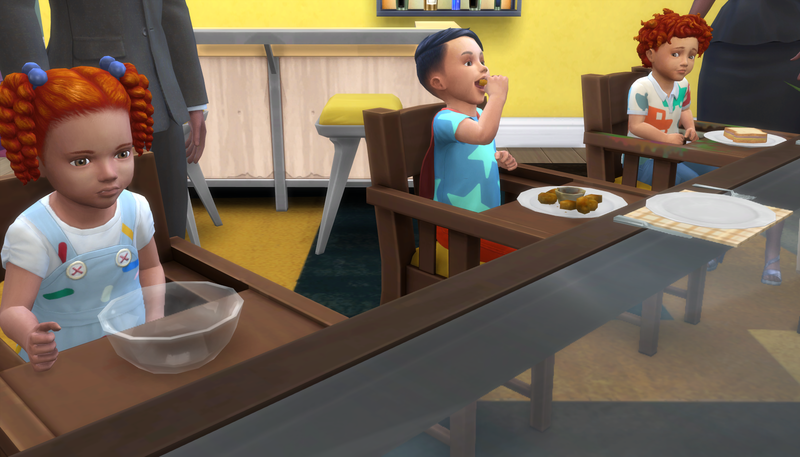 Cristian and Kenya joked with Gavin because he warmed up chicken nuggets for Kai instead of sticking with a simpler option like a sandwich. “But he loves chicken nuggets! I think it’s worth the couple of extra moments to give him his favorite,” retorted Gavin. 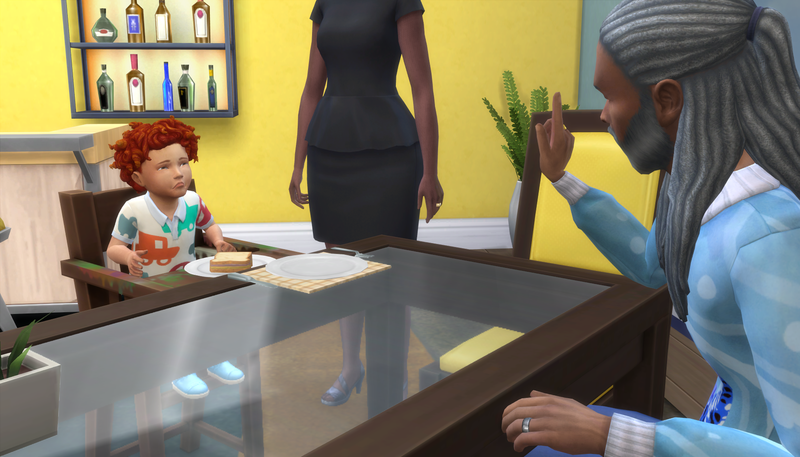 While Gavin was warming up chicken nuggets, Cristian served Wren with yogurt and Kenya served Jamari a sandwich. Jamari, wild child that he was, immediately pushed his sandwich to the floor. Kenya was no pushover like most grandmothers could be. 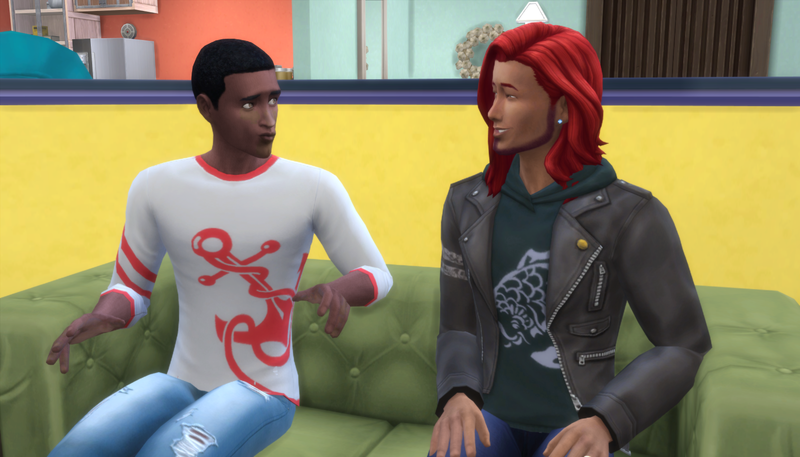 She immediately gave Jamari a talking to about it before giving him another sandwich. Gavin was still at the microwave as Cristian made his was to the other side of the table. He gave Jamari a talking to as well. Precocious or not, he didn’t want to raise anymore misbehaving little boys. Wren was already done with her yogurt by the time the chicken nuggets were done. Something about being this big happy family was getting to Gavin and Akira. 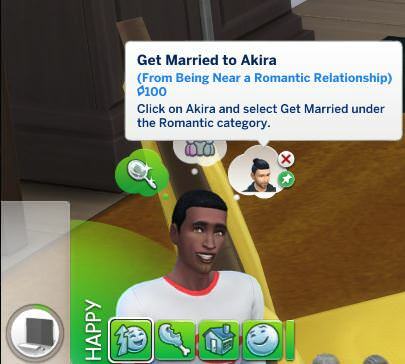 They said they had no intention of marrying, but before long, they started having those thoughts that all Sims in happy relationships eventually have. And the family finally found a solution to Kenya’s senseless jealousy of the maid. One of their downstairs neighbors had a nice man working for them. That family didn’t want a daily maid anymore. 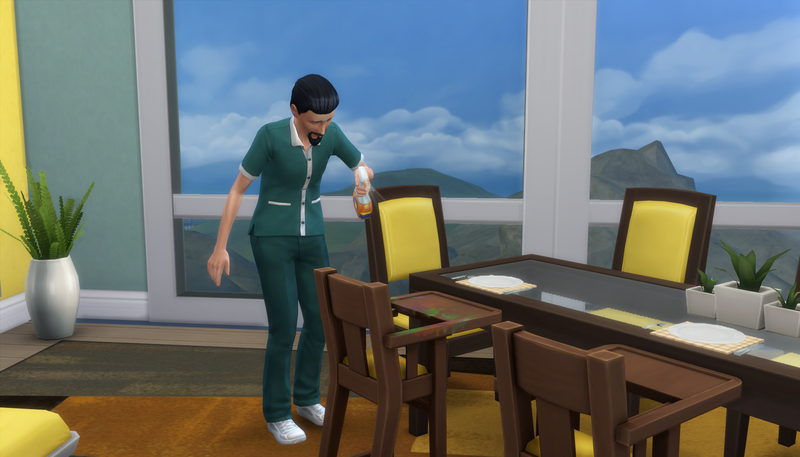 That coincided with the maid for the Ralston-Kibo family wanting to work less to spend more time with her family. 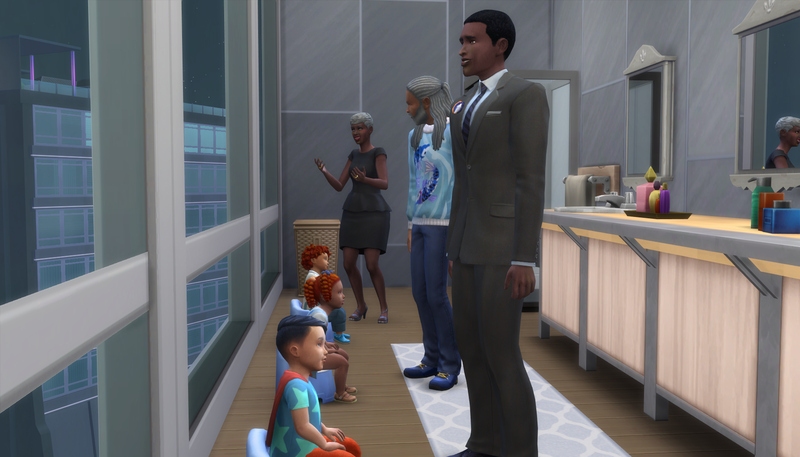 After a quick interview, the families and maids agreed to do a swap. So far, it was working out much better for everyone. 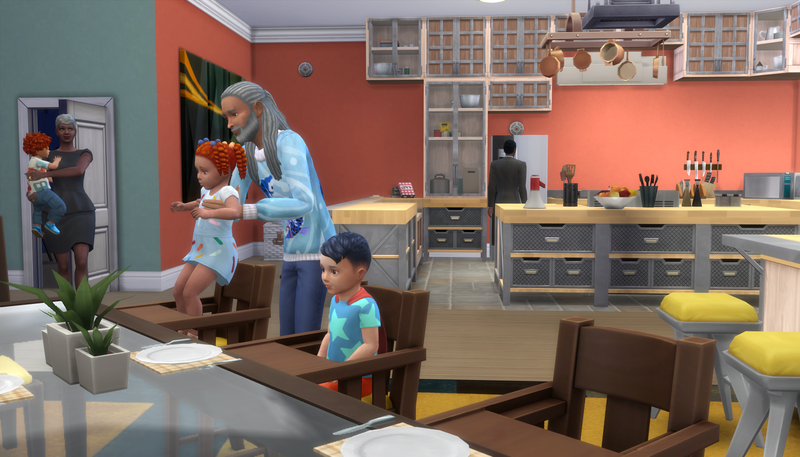 Even with four adults to take care of the toddlers, they were still a handful. Wild Jamari would disrobe just because he felt like it. 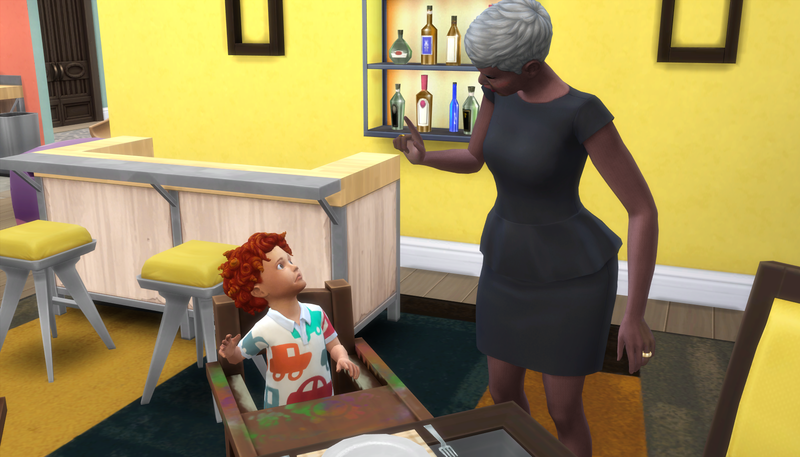 And even angelic Kai would fuss if he was left in his high chair too long. “Thanks…? You know, I think I had something to do with her looks too,” said Gavin. 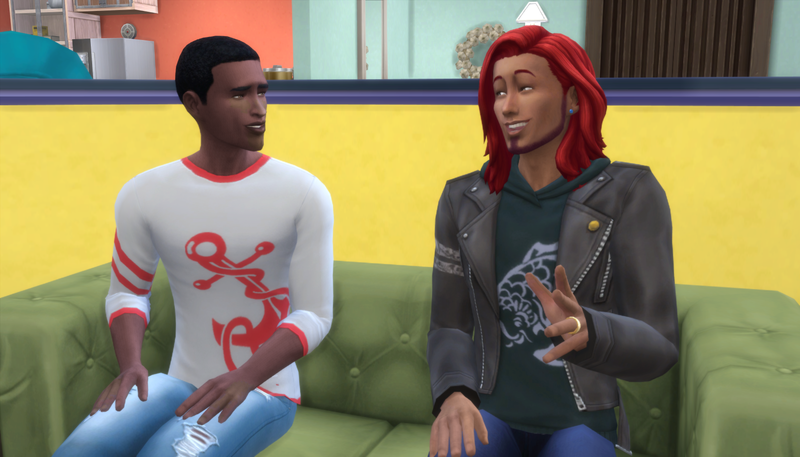 Akira barely stifled his chuckle at this conversation. 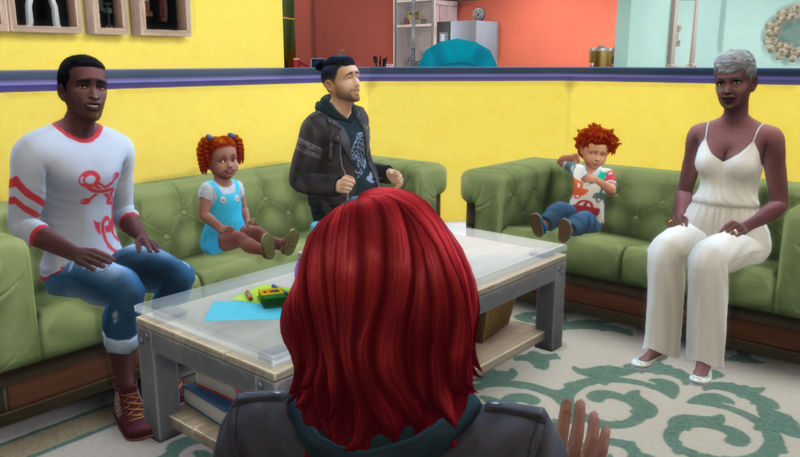 The family gathered in the living room to chat with Baby. He was enchanted by the kids, and was really good with them. He had lots of experience with red-headed toddlers, so that was no surprise. Eventually Kenya and Akira left to put Wren and Jamari to bed. Baby sat down to talk with Gavin. “Where is Kai? I need to see what Akira looks like in mini form,” said Baby. 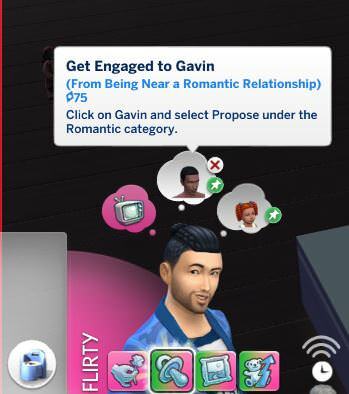 “You really should,” said Gavin. “There are hard choices that have to be made in the name of doing what’s best for your children. I spent the last years of my youth living with my grandparents, I’m not sure if I ever told you that. 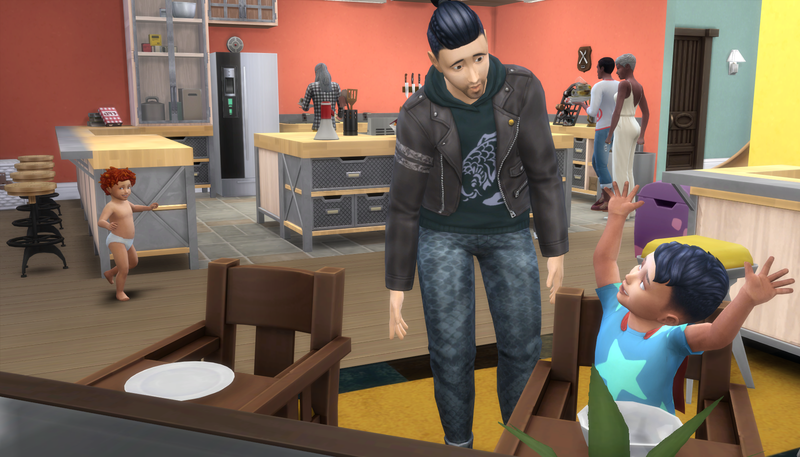 “No, I didn’t know that, I thought you moved with them after you graduated,” said Baby. Baby is my FAVE, lol. 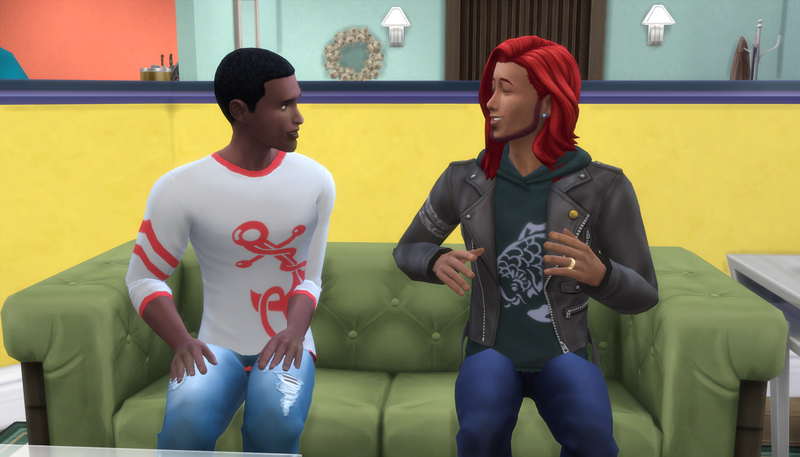 His story with Robyn is far from over, but… how do I put this… they’re on a slow burn, haha. No playing favorites! Lol, just kidding, you can have a favorite. I’m looking forward to seeing bits of their mother come out as they grow up. I kinda wanna PM you what the kids look like all grown up! Whoa….I’m wondering now how this is going to go down. Baby doesn’t know the one he loves is pregnant! You’re right. He doesn’t know. All he knows is that he gave in to his desire, crossed a line he probably shouldn’t have. Will Robyn tell him there’s a chance it’s not his baby? And for that matter, whose baby is it? 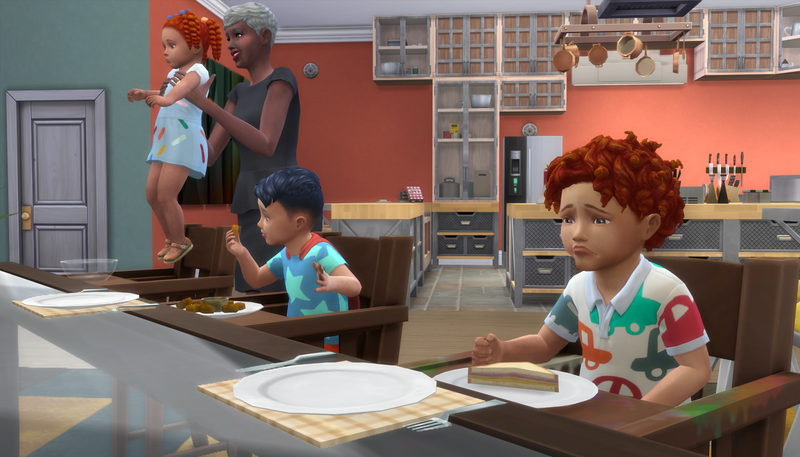 I love spending time with each family, but I have to admit, my favorite is seeing characters like Baby who interact with almost every household. BABY! 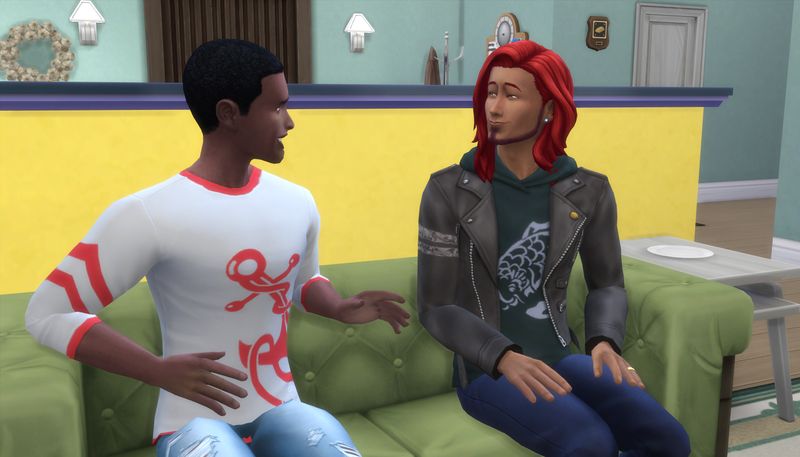 I loved seeing him 😍 And hearing him open up about his feelings… I’m really looking forward to seeing how he deals with this… can’t wait for a Robyn chapter! Ahhh. I love them together but it’s all so messy! But yeah, I’m really looking forward to getting to the Epstein household. I can’t wait to show what happens next. BABY! I’m happy to see him. I wonder what he’ll decide ? I knew you’d love seeing him, lol. When we get over to the Epstein household, we’ll see how that situation plays out. I would be worried, but Baby’s got this way of handling even the most challenging situations with his own brand of grace! I love Baby so much. I was just talking to a Simlit friend today about giving him more life. I’d you’d ever be interested in adding him into one of your stories as an alternative universe/reincarnation thing, let me know! Oh! There’s a thought! I’ll have to consider that–he’s so iconic in your story, I’m not sure I can imagine him in a different universe… Let me ponder it a bit!